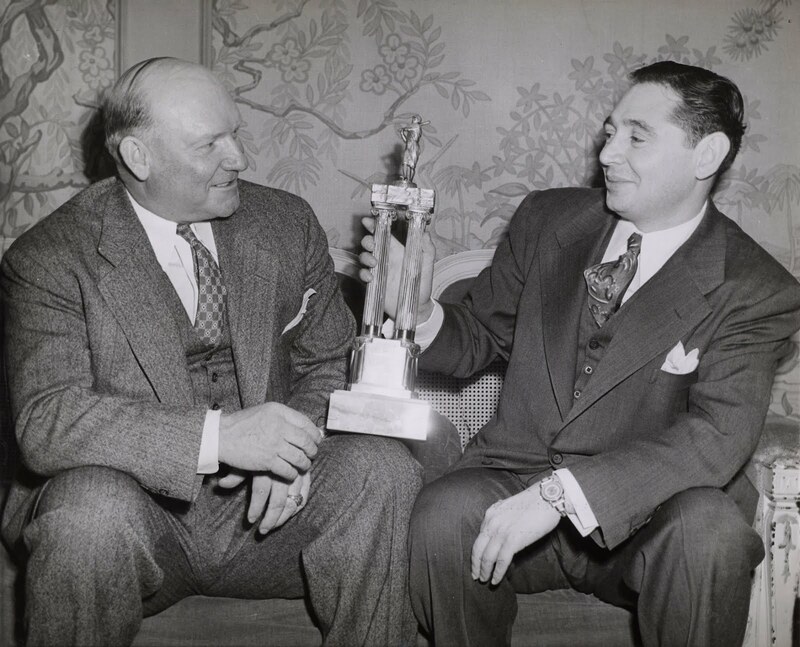 This December 2, 1945 wire photo shows Brewers manager Nick Cullop posing with Chicago lawyer Oscar Salenger, new team owner, six weeks after Salenger bought the club from Bill Veeck. Together they hold the trophy Salenger's new club won in 1945. Oscar Salenger (right), new owner of the Milwaukee Brewers, and Nick Cullop (left), team manager, admire American association trophy which was awarded to team today, for winning the American Association pennant in 1945. They both are attending the annual conference of minor league baseball clubs in Columbus, O., Dec 2. Salenger and Cullop were in Columbus for the American Association's annual off-season convention. 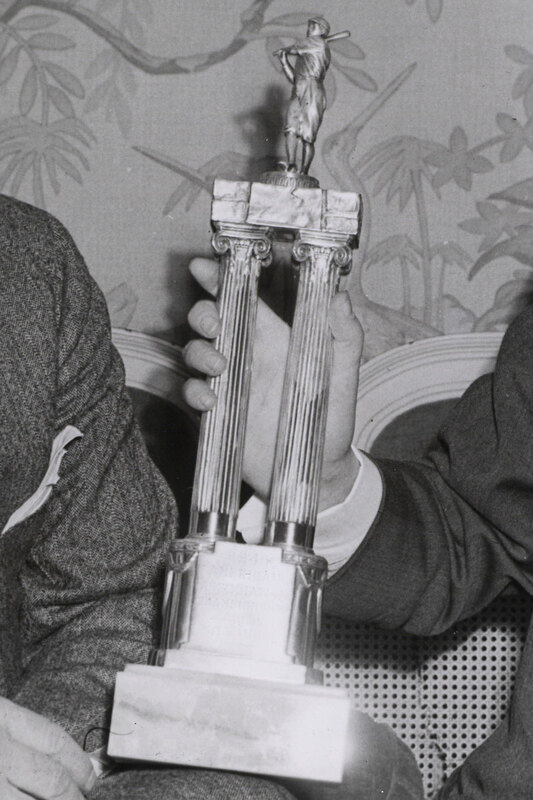 There was much business to be done at the meeting: players were bought and sold, the 1945 trophy was awarded to Milwaukee, and the club's sale to Salenger was ratified. Salenger didn't waste any time following his official welcome as Brewer boss; he personally nominated the Kansas City Blues' president Roy Hamey to fill the vacant Association presidency, a nomination which was unanimously ratified by the member clubs. For a league championship trophy of a respected top-flight minor league, it isn't actually all that impressive. It's nowhere near as spectacular as the one Bill Veeck bought himself just to celebrate the 1942 season opener. Still, it represented a momentous year in Brewers history, the third of three consecutive championships the Brewers brought home to the Cream City. I wish we could read the inscription. All in all, that meeting in December of 1945 must have seemed an auspicious beginning to Salenger's ownership of the club. Veeck was gone, but a new owner was ready to step up to the plate.